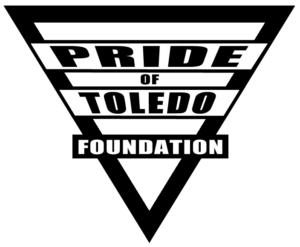 The Pride of Toledo Foundation was established in 2011 as a registered non-profit as the primary host of Toledo Pride – an annual area celebration of the LGBTQIA+ community. Every year, the Pride of Toledo Foundation along with many other area sponsors welcomes thousands of participants who take part in Toledo Pride. Pride of Toledo also hosts Opera Ain’t No Drag in coordination with Toledo Opera to bring together the local LGBTQIA+ and arts communities. Hundreds of people fill the Collingwood Arts Center annually to partake in a fantastic night of live opera, drag queens and kings. In the coming years, as the Pride of Toledo Foundation continues to grow, we will aim to financially aid area events, organizations, programs and businesses that support the LGBTQIA+ community. Toledo Pride is thrilled and humbled by the support we have received from our community.